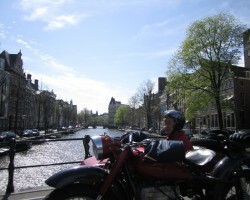 This is a tour in which you will explore the inner city and see the roads less travelled. It is a great way to get to know the city. 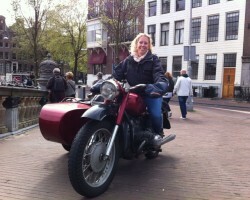 Amsterdam has many small streets and narrow alleys and a sidecar motorcycle is perfect for traversing these paths. 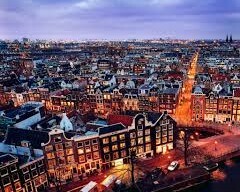 The center of Amsterdam is rather small and can easily be explored in 2 hours. If you have less time than, there is also the possibility to do a 1 hour tour. 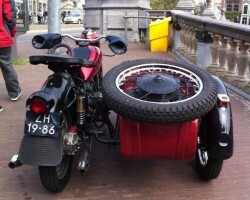 In a one hour tour you will see the essentials, however you will still get a good feeling of seeing Amsterdam in a sidecar motorcycle. The tour is private and fully customisable to your own specific needs. You can stop anywhere you like and take as many pictures as your camera will allow. Helmets, rain gear, scarfs, gloves and extra thick coats are provided, if necessary. In case of rain or very bad weather, you can reschedule if available, or cancel your booking (for which you will be fully refunded). All tours start and end at your hotel or place of choice.